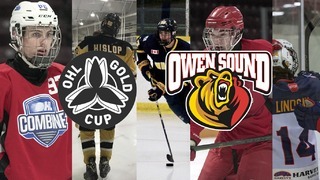 The Owen Sound Attack are ready for their busiest week of the season with four games in six days and a road trip through Michigan. This is your Joe Tomato’s Weekend Preview. The Attack kick off Week 22 with a midweek matchup against the Barrie Colts. 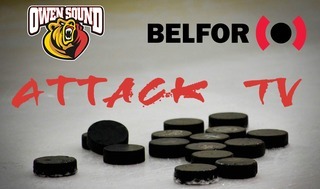 Last Thursday, Owen Sound beat Barrie 4-2 behind the strength of a Kaleb Pearson brace in the first five minutes, ripping two wrist shots past netminder Jet Graves and getting the Attack off to a great start. The season series between the two teams is tied at two apiece and with the Colts batting for the 8th and final playoff spot in the Eastern Conference, this will be a hotly contested game at the Bayshore. Ryan Suzuki is always a player to watch on the Colts. The younger brother of former Attack forward Nick Suzuki, Ryan is expected to go in the 1st round of the upcoming NHL draft. 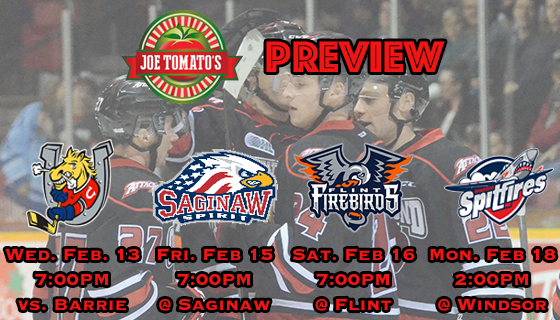 After beginning the week at home, the Attack head south to Saginaw to begin a 4-day, 3 game stretch that includes games against the Spirit, Firebirds and Spitfires. The Friday night affair against the Spirit will be only the second meeting between the two teams this season, and the first in Saginaw. The Spirit are currently just 4 points back of Sault Ste Marie for 1st in the West division, and they’ll need all the wins they can get. Look out for high-flying forwards Cole Coskey and Owen Tippett to always be a threat. Ivan Prosvetov is known for doing cartwheels after wins, but the ’99 born goaltender is one of the best in the league. Saturday night’s matchup against the Flint Firebirds will be the most tropical game on the Attack schedule this season. It’s Flint Tropics night at the Dort Federal Event Center, with special jerseys and promotions honouring the Will Ferrell movie ‘Semi-Pro’. The Firebirds are currently last in the OHL, but have turned things around after a tough start to the season. Ty Dellandrea is one of the best ’00 born forwards in the league and can put up points in a hurry. The weekend ends with a Family Day matinee against the Windsor Spitfires at the WFCU Centre. The teams last met two weeks ago in a thrilling overtime win for the Attack at the Bayshore, but this time around coach Al Letang wants a solid 60-minute effort without needing the extra frame. 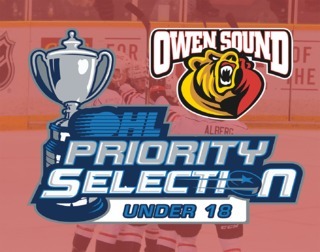 It will be the endcap to a long and tiring road trip for Owen Sound, and 2 points against the 8th place Spitfires will be crucial to securing the Attack’s seed heading into the playoffs. There’s always something delicious going on at Joe Tomato’s. 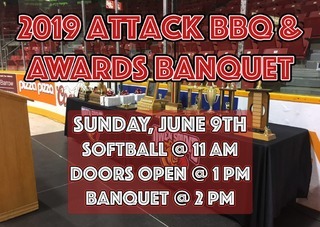 After every Attack home game, bring your ticket stub in for half priced wings and appetizers at Joe Tomato’s in the Galaxy Centre on the Sunset Strip, Owen Sound.